Dubbed "The Loveliest Town in Canada," Niagara-on-the-Lake lives up to the nickname with a setting along the shores of Lake Ontario and near the mouth of the Niagara River. As if that weren't enough beauty, the town is also surrounded by lush farmland and wineries, while its picturesque downtown includes elegant 19th-century buildings. Culture vultures flock to this historic town for the annual Shaw Festival, which showcases playwright George Bernard Shaw and his contemporaries, with works staged at the town's 3 revered theatres. Niagara-on-the-Lake offers numerous inns, bed-and-breakfasts, and vacation rentals, which are popular with vacationing couples, families, and solo travellers. You don't have to look very far in Niagara-on-the-Lake to find a historic landmark – there's plaques tucked away in practically every corner. The town saw a lot of action during the War of 1812, and restored sites like Fort George, Navy Hall, and Butler's Barracks are open for tours. Niagara-on-the-Lake also boasts the oldest Anglican and Catholic churches in the province of Ontario – the 1791 St. Mark's Church and the 1826 St. Vincent de Paul. Golfers have been practicing their swings since 1875 at Niagara Golf Club, the oldest surviving golf course in North America still in use. 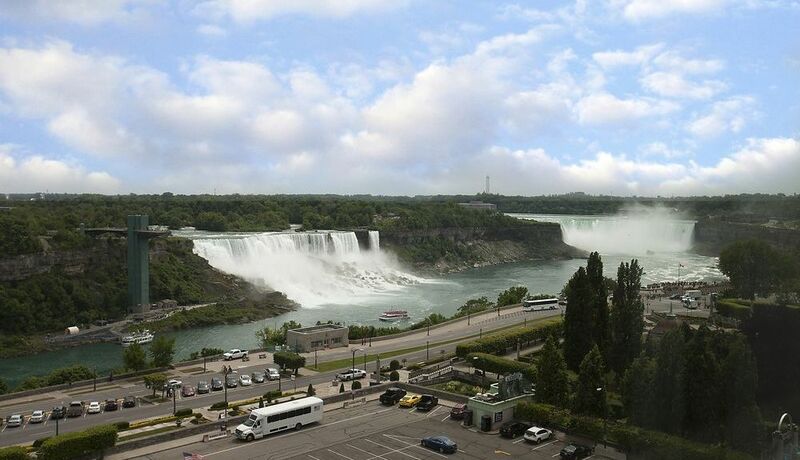 Fly into Niagara Falls, NY (IAG-Niagara Falls Intl. ), the closest airport, located 12.6 mi (20.2 km) from the city center. If you can't find a flight that's convenient for your trip, you might consider flying into Buffalo, NY (BUF-Buffalo Niagara Intl. ), which is 28.1 mi (45.2 km) away. Wine's the name of the game in Niagara-on-the-Lake, as the surrounding area is home to over 20 wineries and vineyards. You'll not only get the chance to sample local varieties in tasting rooms, but many regional wineries also feature upscale restaurants with farm-to-table cuisine. While you're exploring the rural countryside, make sure to stop at a roadside fruit stand for an array of cherries, apples, blueberries, and peaches – the latter is so popular, Niagara-on-the-Lake has an entire festival celebrating the fuzzy fruit. Of course, no trip to Ontario is complete without a sampling of maple syrup or poutine, and you'll find plenty of both in town. Niagara-on-the-Lake has a population of 17,500 residents. The official language is English, but you'll find a number of locals who also speak French. The Canadian dollar is the currency. While some businesses will accept the US dollar, you should check to see if the exchange rate is in your favour. If you're dining out, the customary tip ranges from 15-20% on the total bill before tax. Canadian provinces and territories can set their own legal drinking age, and Ontario's is 19. Niagara-on-the-Lake is a very safe town with little crime, but you should always exercise caution while travelling. Where to stay near Niagara-on-the-Lake? Our 2019 vacation rental listings offer a large selection of 555 house rentals near Niagara-on-the-Lake. From 336 Houses to 60 Cottages, find unique vacation rental for you to enjoy a memorable holiday or a weekend with your family and friends. The best place to stay near Niagara-on-the-Lake is on HomeAway. What is the best area to stay when travelling to Niagara-on-the-Lake? What are the popular points of interest near where I can stay when travelling to Niagara-on-the-Lake? But there are many other points of interest around Niagara-on-the-Lake listed on HomeAway where you can find your place to stay. Please use our search bar to access the selection of vacation rentals available near the point of interest of your choice. Can I rent Houses in Niagara-on-the-Lake? Can I find a vacation rental with pool in Niagara-on-the-Lake? Yes, you can select your preferred vacation rental with pool among our 89 vacation homes with pool available in Niagara-on-the-Lake.